Please complete the Registration Form AND Liability Waiver. Each player must sign a waiver. $25 donation to join in the fun! When: Sunday, March 24, 2013 @ Longevity Sports Center. Each entry (player) receives a t-shirt and 5-raffle tickets for chance to win the Grand Prize. Grand Prize: 2 nights stay at SpringHill Suites plus $100 for dinner at Palettes Bistro (total value at $500). Additional raffle tickets can be purchase for $2 each to help increase your chance. Don't Want to Play? You can still support the cause by donating $25 (receive a t-shirt & 5 raffle ticket entries) towards the drawing for the Grand Prize. The player - 'last man' standing will receive a Custom Design Winning Medal and braggin' rights! 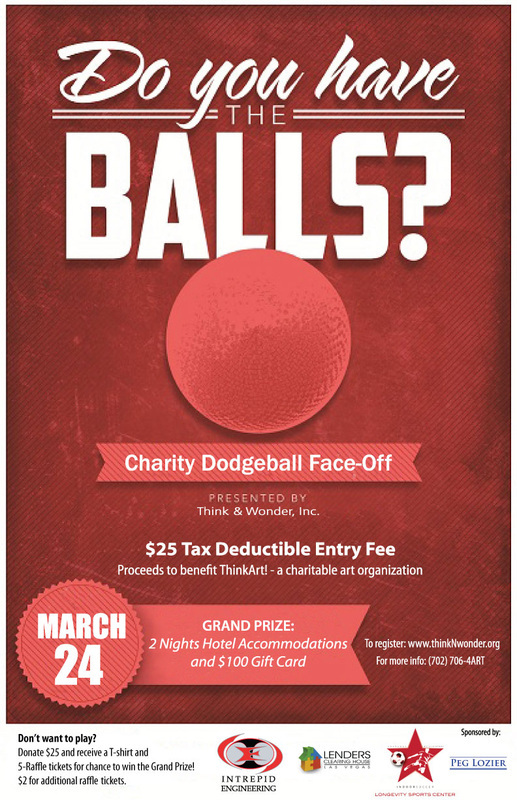 Make check payable to: Think & Wonder, Inc.
Each player is required to complete a Legal & Release of Liability Waiver. Balls will be an 8” vinyl-covered foam official dodgeball. Most rules will be in accordance with the National Amateur Dodgeball Association. Raffle Grand Prize drawing: One winner will receive 2-nights hotel accommodation at SpringHill Suites Convention Center plus $100 gift card good toward Palettes Bistro & Gallery inside SpringHill Suites. The 'last man' standing player (game winner) will receive a custom design gold medal and of course, the ultimate prize...Braggin' Rights! $25 charitable tax deductible donation; includes one T-shirt and 5-raffle tickets for Grand Prize drawing. _More coverage: Dip, Dive and Dodge for ThinkArt! Video footage of our Scrimmage Games! We offer open games on 2nd Sunday of every month (more if there is demand).